So… I may or may not be OBSESSED with Sweet Tooth Fairy Cupcakes. Their cupcake flavors are brilliant and delicious. I love my cupcakes moist and that is exactly what their texture is. But lets be honest for a moment… it is their frosting that gets me every time. I am not even a frosting person, so that is saying something. Back in April, a group of bloggers went and visited/devoured some cupcakes. I had the privileged of sampling their Cookie Dough Cupcake with Cookie Dough Frosting. While you are not getting a cookie dough cupcake today, you better believe you are getting a cookie dough frosting recipe… a cream cheese cookie dough frosting recipe. I have been determined to make my own ever since sampling their delectable cupcake. I used this Copycat Cookies and Cream Sweet Tooth Fairy Frosting as my base and adapted it from there. You can also find an adaption for a Salted Caramel Frosting that is DELISH! Nikki, this is incredible! You are right, I am think I just need to make this and eat it with a spoon. It really looks and sounds THAT GOOD! Yum! This cupcake looks delicious, and salted caramel is my absolute favorite. Nikki this looks CRAZY good. You don't even need cupcakes for this - just a big spoon :) Pinned! I have been waiting for this post since you showed that picture on instagram! Holy yum! I am not a frosting lover either, but this looks & sounds amazing!!! Pinning for sure! Oh my goodness this looks amazing. Definitely pinned so I remember to make it one day! Is there any way to make this gluten free? To make this frosting gluten free, substitute cornstarch for the flour. Just swap out the flour for some rice or potato flour. I do it all the time. I used the Kroger (my local grocery store) version of dream whip. It's called whipped topping mix and it does the exact same thing. Check the baking isle at your grocery store. I used a tub of whipped topping. The texture might have been different, but it was still delicious! I am going to get Dream Whip for the next time I make this. I know where to get it now, but someone also suggested looking at mom and pop grocers that carry funny little things like that. Looks delicious and I only have one question, what is dream whip? I think cream cheese improves any frosting. Have you tried peanut butter cream cheese frosting? It's ridiculous. I can't wait to try this out. Wow - this looks good! Just give me a spoon! That frosting sounds amazing!!!! What is dream whip?! Substitution? 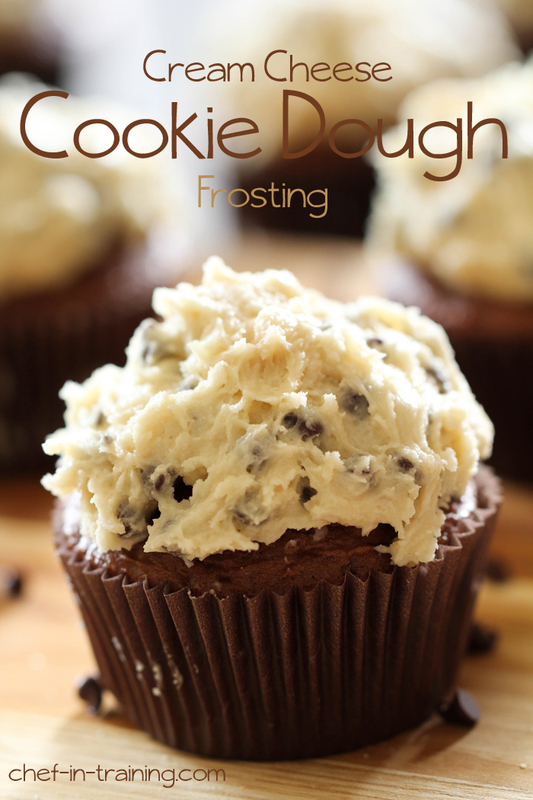 I adore cookie dough frosting! It goes best with spoons, right?! :) Yours looks amazing my friend. Oh mercy! I will have to make this for my cheat day.... YUM!!! This is amazing! I feel like I need to make it immediately! That frosting looks heavenly! I am huge fan of cream cheese frosting and I'm sure this is no exception! Ahhh! I adore cream cheese and to have it mixed with cookie dough is a dream. It totally wouldn't make it past my mouth! Oh. My. Yum. I think I would definitely be eating this straight from the bowl ... no cupcake needed! It looks AhhhMazing! Ok, this looks amazing... but what if you don't have Dream Whip? Is there a substitute, or can it be omitted? oh yum! That seriously does look like cookie dough!!! This sounds awesome! Especially on some chocolate cupcakes!! This may be a silly question, but do you just add the packet of dream whip, or do you prepare it, and then add it? This looks yummy, but I'm with a few other posts, what is dream whip & where can I get it. I don't have a Kroger closer than 2 hours away so that suggestion i saw posted won't work for me. I really want to try this! This icing is great! Made some tonight for cupcakes I'm taking to a party tomorrow. Was skeptical at first because not all recipes I've come across on pinterest have worked out well(I found this site from pinterest) but this is very delicious. So good in fact that I raked the bowl clean after icing the cupcakes and stored the itty bitty leftovers in a container...dunno what I will do with it, but it was just too good to waste even if it was only a tablespoon or so left. This looks AMAZING!! Is there something that can be used in place of the Dream Whip? I made this today for my husbands birthday cake. I had no problem finding Dream Whip on the baking aisle at walmart. I did stop at 1 cup of powdered sugar...I was scared the frosting would be overly sweet. 1 cup was plenty sweet for me :) Most likely will make it again but will probably cut out more sugar. It is just a powdered mix. Amazon and walmart carry it but I am not sure if you are able to get it there. You can definitely omit it and just use a little more powdered sugar. it will still taste great! Hey Karina, I'm also in South Africa and was also wondering what Dream Whip is... I'm going to google it now. Was excited to see someone else from SA on here :) This sounds SO yum and I can't wait to try it. when you use cream cheese in frosting, do you have to store the cupcakes in the refrigerator? I don't like cakes that are stored in the fridge. I cannot wait to try this recipe. If I prepare them the day before serving, do these need to be refrigerated overnight? And if so, should these be refrigerated up until serving? Thanks! I make a lot of home made icings/frostings but I've never heard of putting flour into it :/ is that just to help with the stiffness or a taste thing ?? And it truly does--that, and the brown sugar. Great job! Thank you for this fantastic recipe! Just wanted to say that while this recipe truly was incredible as written, I also made it again, substituting Crisco for the cream cheese because I didn't have any, and it was an even bigger hit with the non-cream cheese lovers. Also, before adding the chips, I divided the frosting into two batches and put chips only into one. Loved it. Still tasted like cookie dough frosting--it was wonderful. Oh, and we DO eat just the frosting on a spoon around here! Do you think if I add a tablespoon or two or three of unsweetened cocoa I could make this chocolate? I'm wanting to match the cupcakes!! I've featured your mouthwatering frosting on my blog, hoping that you don't mind, but if you do, please contact me and I'll remove it. All the best. Does this frosting need refrigerated overnight? Hi ..also from SAfrica but living in Greece.! Anyone else in SAfrica found a substitute for dream whip ..or maybe in Greece?! And is powdered sugar what we call icing sugar? This is going to be perfect for my hubby's bday cake! What is dream whip though? It is a powdered ingredient that comes in packets. It can be found next to the pie fillings and pie crusts down the baking aisle :) Hope that helps. Let me know if you have any other questions! For the gluten free version, would I add the entire 1/2 cup of cornstarch? how many tbsp is one envelope of dream cream? I got a similar stuff but dont know how much to put in. Is there any substitute that can be used for the dream whip? Wow! that's definitely a frosting to add to my recipes! Thanks so much for sharing it. It's bromated flour that is bad for the thyroid, so buy "unbromated" flour and you are golden! Hope this helps for people who are worried about eating raw flour. I buy "Wheat Montana" flour... it's unbromated, non-gmo, etc, etc. Hope this helps! For gluten free… how much cornstarch should be used? And where would I find Dream Whip? Why is there flour in it? Is it ok to eat raw flour ?it kinda sounds unhealthy. I didn't think you could eat raw flour at all. I've been scrolling down all the comments and can't believe yours is the first to mention this. Is it safe to?? What a combo! 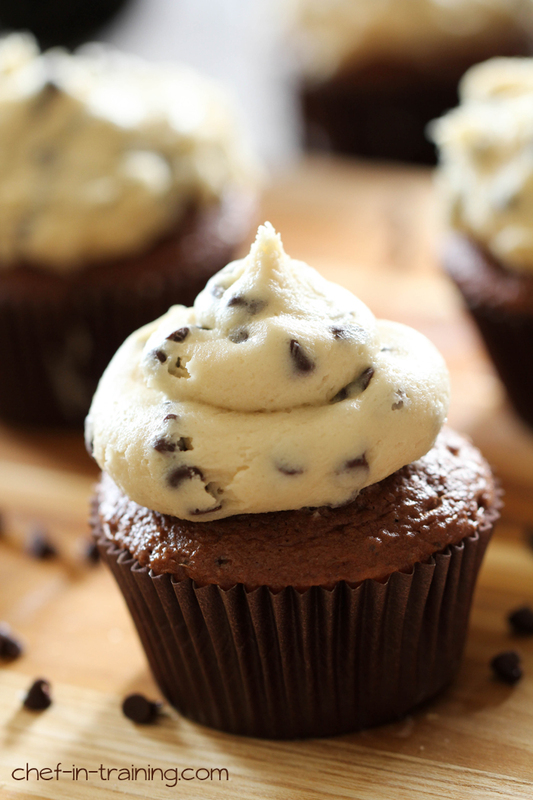 Cookie Dough and Cupcakes! Both my favorites in one! Is there any way to make this gluten free?? You can exchange 1/2 cup of flour with 1/4 cup corn starch. I've done this and it works out well. This frosting sounds absolutely great, and unfortunately one we probably shouldn't indulge in very often :). However, I have a problem w/ the "risk" in consuming raw flour. What KIND of risk? If you are allergic to wheat, you couldn't have flour raw OR cooked. Otherwise, I think if you take a look at 21st century milling processes, you will find that common white flour has pretty much had everything taken out of it. At this point in time, it almost has no nutritional value. I do think that there are many people out there today that are becoming afraid to eat almost anything- due to "inherent risk". This should stop. Now. I have never seen "died from eating raw flour" on anyone's gravestone and I'm 100% confident that I never will. I love all things chocolate and Cookie Dough!! What is Dream whip? I'm from Malaysia and I have not come across that term before. Why is flour added ? Just made this frosting. Only needed to use 2 cups of powdered sugar and it was awesome! My son who loves anything chocolate chip cookie dough loved it. Will definitely keep this in my permanent recipe file. What kind of flour do we use, all purpose flour? will powdered egg white work in place of the Dream Whip? Absolutely nauseating. This frosting is sickly sweat and the recipe could use some tweaking. Does not taste good on cupcakes. Maybe as apple dip or on graham crackers.